Abstract: Malaria is a major threat to the public health worldwide as it is effecting populations in tropical and subtropical areas globally. Among those populations are around 40% of pregnant women and children who are susceptible to this disease. 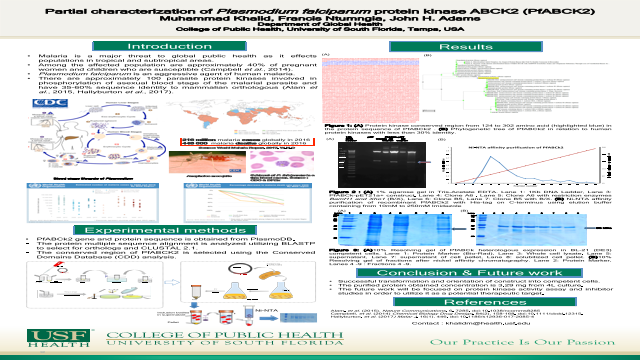 Plasmodium falciparum is the agent that causes malaria in human. There are approximately 100 protein kinases in this parasite that are involved in phosphorylation of asexual blood stage. Hence, the phosphorylation plays an important part in the development of different stages of malarial parasites. Campbell, et al. (2014) Chemical Biology Drug Design, 84(2), 158-168. doi:10.1111/cbdd.12315.